Kombucha, an effervescent beverage originating in Asia, has received much attention lately in the neutraceutical and alternative health industries as being an anti-carcinogenic, fermented tea. It is believed to help regulate the gut microbiome, aid in metabolism and cell proliferation, increase detoxification, and help protect the liver. Kombucha originated in China over 2,000 years ago and made its way into Russia, where it was known as tea kvass. In the last century, Kombucha has increased in popularity in the Western world, however due to its recent introduction, there is very little scientific evidence to support its many health claims. Though further research is needed to support its claim as a true probiotic, it is similar to other microbial-based foods with documented health benefits. Kombucha is a fermented tea consisting of a symbiotic culture of bacteria and yeast (SCOBY). The dominant bacterium is Gluconacetobacter xylinus (formerly Acetobacter xylinum), it can be paired with many genera of yeast: Zygo-saccharomyces, Schizosaccharomyces, Saccharomyces, and Saccharomycodes. Kombucha is made by adding the SCOBY to sweetened tea and allowing it to ferment. G. xylinusferments the alcohols produced by the yeast into acetic acid. The high acidity and low ethanol content give the culture intrinsic resistance to contamination by most airborne molds or bacterial spores. 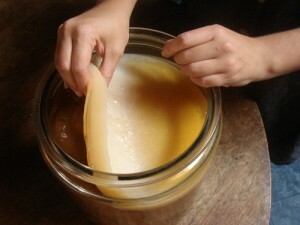 Within several weeks of adding a starter culture, the SCOBY will form a thick layer on top of the liquid (see photos). Kombucha has seen increasing attention over recent years with many new companies capitalizing on the craze. 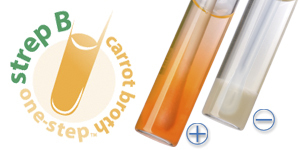 The resulting liquid contains vinegar, B vitamins, and a number of other essential nutrients and chemical compounds. The benefits of drinking a fermented tea are not well documented. Many epidemiologic studies were conducted in Russia in the early part of the 20th Century where doctors noticed a lower rate of cancer in regions where the tea kvass was popular compared to regions where it was not. Recent research shows that regular brewed teas contain a variety of antioxidant properties, and that probiotic foods can help promote the growth of favorable microorganisms in the human gut microbiome. Yet, is it beneficial to combine the two? Epigallocatechin gallate (EGCG) is the main antioxidant found in green tea and in Kombucha fermented from green tea. EGCG may have some benefit in the treatment of AIDS and cancer as it has been shown to bind to the CD4 molecule on T cells and inhibit the anti-apoptotic protein Bcl-xl in vitro (Williamson et al. 2006). D-saccharic acid 1,4 lacton (DSL) and glucuronic acid are also found in Kombucha (Gunther 2003). DSL inhibits glucosidase activity, leaving glucuronic acid to neutralize carcinogens such as polycyclic aromatic hydrocarbons, some nitrosamines, aromatic amines, and fungal toxins (Dutton 1980, Levvy and Conchie 1965). However, recent research shows that it is more likely that glucaric acid is the active component in Kombucha. Glucaric acid inhibits beta-glucuronidase activity in normal gut bacteria, thereby reducing the potential for toxin recycling and increasing the liver’s efficiency. There is limited research on the effects of Kombucha consumption in vivo. In one study published in the Journal of Food & Function, researchers fed Kombucha brewed for four days from black tea to mice with stomach ulcers. They found no significant difference in the effectiveness of treating the ulcers between the control medication, omeprazole, and Kombucha (Banerjee et al. 2010). 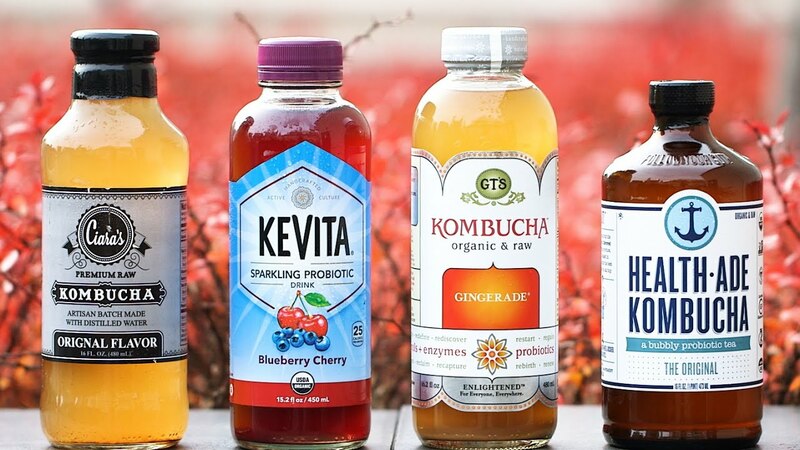 While many people who tried Kombucha have told tales of health transformation, some doctors caution against it without considering all the potential side effects. People with compromised immune systems should avoid interactions with live cultures, especially ones made in an amateur or home-brew environment. However, if you are a healthy individual looking for a wholesome alternative to traditional nutrient-poor and sugary soft drinks, Kombucha may be worth trying. This entry was posted in Micro Musings and tagged Kombucha, microbiology, science, under the microscope. Bookmark the permalink. ← Could Alzheimer’s Disease be a Response to Infection?